Now that Miles is 4 months old, I have had a little bit of time to really reflect on my pregnancy. For the most part, I felt pretty good during my pregnancy. I carried on with my normal routine until about 15 weeks when I started getting terrible daily headaches after a busy month of work travel. I felt like my body was literally telling me to take it easy, slow things down. So I did. I embraced early nights in, no travel, less hustle, and relaxing days decorating Miles’ nursery and reading every baby book I could get my hands on. 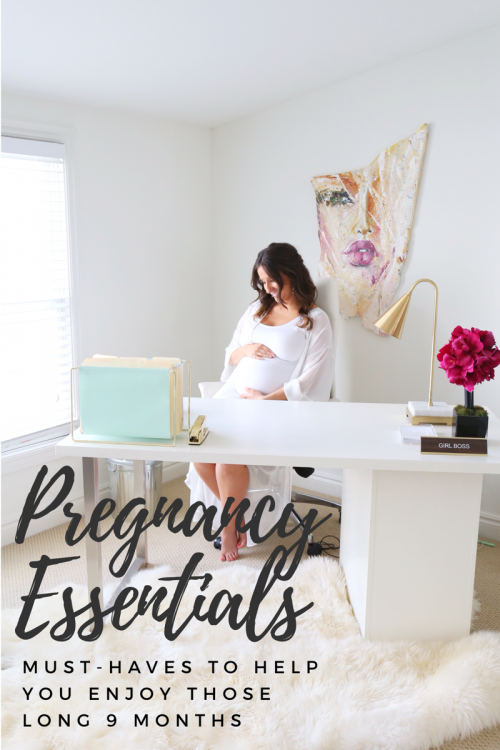 I started following all the big mommy bloggers and really dove into preparing for motherhood. Below are some things that helped me enjoy those 9 (well, really 10) long months. 1. Barefoot Dreams Cardigans – I received one of these Barefoot Dreams Cardigans as a gift and wore throughout my entire pregnancy. Once Miles was born, I bought 2 more with pockets (for my phone + paci + burp cloth) and pretty much live in them. It’s basically like wearing a cozy blanket all day. 2. Leggings – Pretty much all I wore for those 9+ months. For a non-maternity option try the Align Leggings (in a size or two up) or my absolutely favorite maternity option, Blanqi Leggings, which have great built in belly support. 3. Sprocket Printer – I loved scrapbooking and documenting my preggo journey. My brother bought me the Sprocket Photo Printer that easily prints small (perfect scrapbook sized) photos from your phone, so I used that to create a special “Expecting You” journal for Miles. 4. So.Many.Vests– I didn’t mind showing off my bump, but my tush and hips had a mind of their own those 9 months, so I lived in long vests with a fitted maternity top and obviously, leggings. 5. Weekly Blow Outs – I forgo my bi-annual keratin treatments while pregnant, so not only was my hair extra frizzy and curly but it nearly doubled in thickness. For some, that’s a blessing, but definitely not anyone in my family. So I treated myself to a weekly blow dry bar appointment. 6. Snapchat Bump Pics – I was diligent about documenting my growing bump and found this to be the easiest way. I took a photo each week using the snapchat app and wrote how many weeks I was right on the image. I didn’t usually send them out, just saved them to my camera roll so I had an easy way of remembering how far along each pic was. 7. Acupuncture – I started going to acupuncture for the first time when I was pregnant to try and cure those horrible headaches. I now swear by it. Pretty sure it also put me into labor. I went to acupuncture at 2:30 pm and went into labor at 5:30 pm, a week early. Can’t hurt to try it in those last long weeks. I went to Alex Herman at Citizen Yoga in Royal Oak, Michigan. If you are local, I highly recommend her. 8. Pregnancy Pillow – I bought the huge pregnancy pillow that takes up half the bed, but ended up loving the Boppy Wedge much more. I am a big pillow gal, so I didn’t like that I couldn’t use my regular head pillows with the large ones. 9. Funny Pregnancy Books – Sure, get all the regular ones too but I loved reading the ones that get a little more real, like The Girlfriend’s Guide to Pregnancy and Jenny McCarthy’s Belly Laughs. My overall tips, just relax, enjoy it and soak it all up. I swear you forget the tough parts. You are growing a tiny human in your belly and the best is yet to come. This entry was posted on Tuesday, October 3rd, 2017 at 4:54 pm and is filed under Gift Ideas. You can follow any responses to this entry through the RSS 2.0 feed. You can leave a response, or trackback from your own site. I love the suggestion of the funny pregnancy books. I will be sure to check these out! And I’ve always wanted one of those large pregnancy pillows. I love pillows too.